The bill Gov. Ted Strickland calls “common-sense legislation”, establishes Castle Doctrine in Ohio and clears up ambiguous sections of Ohio's concealed carry law goes into effect September 9, 2008. Castle Doctrine is arguably the most important part of SB184. Indeed, this was the entire bill when it was introduced. As stand alone legislation it passed the Ohio Senate with a unanimous 32-0 vote. Even if every other improvement were stripped from this bill, this alone would have been a significant piece of legislation. It is important to note that Castle Doctrine does not apply simply to those with a CHL, or just those who have a gun, but to all law-abiding citizens who are victims of a violent crime. No matter how you choose to defend yourself (including being pacifist), this law is important to you. 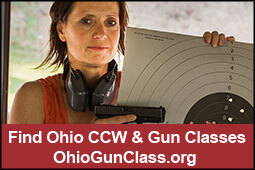 Also included in SB184 are several pro-gun provisions that make Ohio's concealed carry laws more “user friendly”. Among these revisions include important clarifications for persons without a Concealed Handgun License (CHL) to legally transport firearms in an automobile, and pick up/drop off abilities for license holders in school safety zones. The bill also designates mandatory legal fees for gun owners who require court orders to have firearms returned to them, decriminalizes concealed carry in privately owned parking garages, allows permit holders to carry a firearm in an unlocked glove compartment or center console and removes the written test requirement for renewal of a concealed handgun license. The Ohio Attorney General has issued an updated version of Ohio’s Concealed Carry Law booklet. The office reports that printed copies of the new book, which is the third version issued since original passage of Ohio's concealed carry law in 2004, will be in the hands of the sheriffs when the law takes effect. Printed copies of the book should be available for instructors and the general public by September 15.